You can easily set this plugin to mark your ads as Premium, Move on top, make them Highlighted and paid publication on the classified website. Osclass 2Checkout plus is a perfect tool to make an additional income from your website. 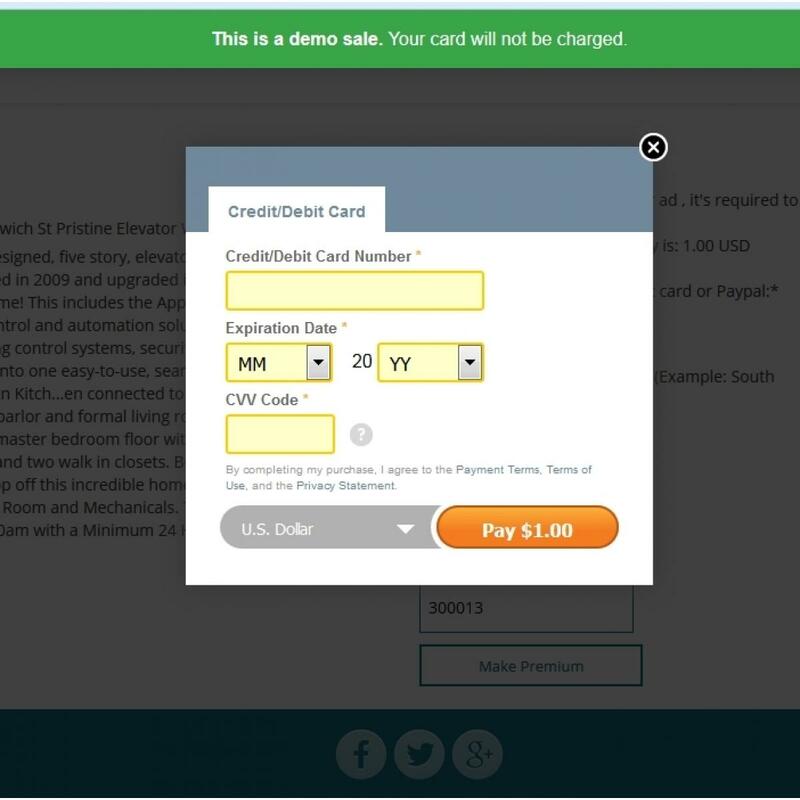 It allows you to work with 2Checkout Standard/Inline Payments. A worldwide leader in payment services, 2Checkout maximizes online sales conversions by giving global buyers localized payment options. Trusted by over 50,000 merchants, 2Checkout supports transactions in 196 countries through 8 payment methods, 87 currencies, and 15 languages. 2Checkout offers 8 payment methods: Visa, MasterCard, Discover, American Express, Diners, JCB, PIN debit cards with the Visa or MasterCard logo, Debit cards with the Visa or MasterCard logo, PayPal. 2Checkout.com offers the checkout process in 15 languages: English, Chinese, Danish, Dutch, French, German, Greek, Italian, Japanese, Norwegian, Portuguese, Slovenian, Spanish-European , Spanish-Latin American, Swedish. 2Checkout’s online processing services are available in over 200 countries worldwide. Premium status is a standard feature for Osclass script when the paid ads are highlighted and shown on top of free ads. The plugin allows to automate this process. Any user can pay by 2Checkout to set the ads as Premium. Administrator can easily configure the price and the number of days which the ads will be displayed as Premium. You can set it as you wish. Administrator also sets the price for Premium features. You can set a default price for all categories or you can set a specific price for each category. There is an additional function in this 2Checkout plus plugin. This function moves an ad on the top of the chosen category and the main page too. User can pay to move his ad/ads on top. These ads get listed below the Premium (if there are some) and will be decreased by newly listed ads by other users. Administrator can set a default price for the move on top option in this 2Checkout plus Payment Plugin and also set a specific price for each category. Pay to Publish ads option You can set this option ON to make users pay to publish the ads. User can ad a new listing, click the publish button, but it will be visible on the website after the payment is released. Administrator can set the price for all categories or a single category. If this feature is enabled. User after the published ad redirect to page immediately offered to pay Premium and Highlighting. See screenshot. This allows you to get more payments. Bottom of the After publish page there is a button - no thanks.The user can press it and nothing pay at once - publish a classified. And pay premium option later from the personal account. All option can be enabled or disabled by the administrator from admin part. 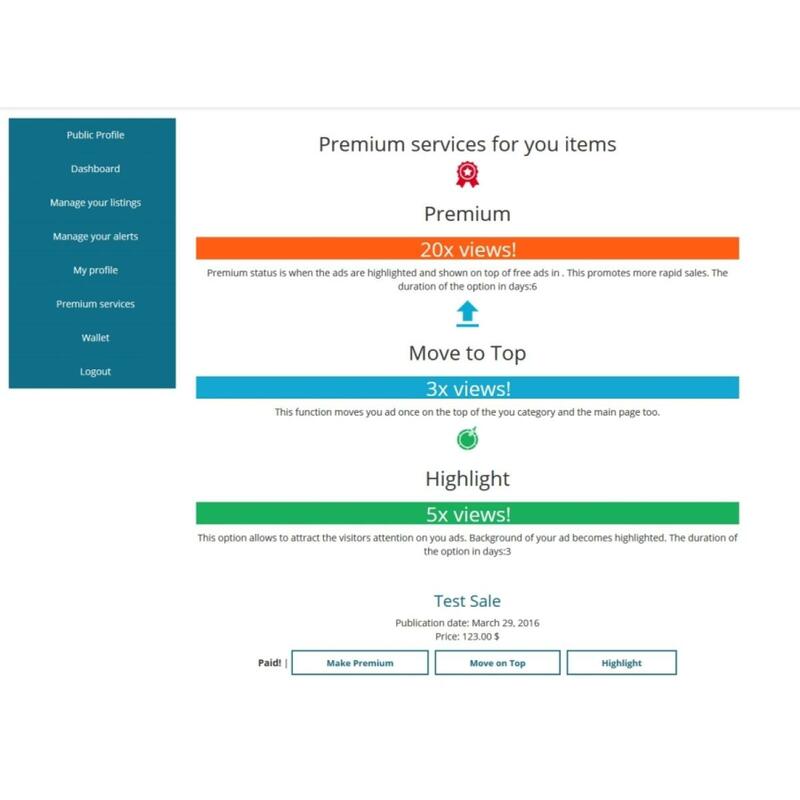 If the user is logged on the site - he can pay from item page: Premium, Move to TOP and Highlight. You can enable/disable this buttons for users. 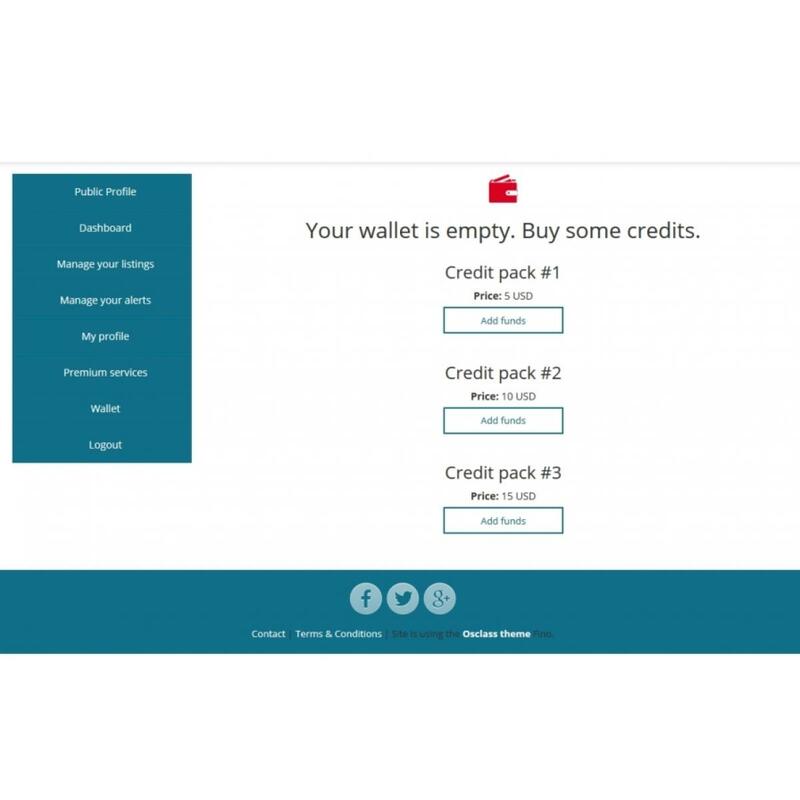 The administrator can see all of the payments that have been made on the site. Amounts, User ID, Item ID and which premium feature is paid by user. 1) Highlight option for work requires small changes in the theme files. Read Help in admin part of plugin. 2) Functions After publish and Pay Publish Not compatible with plugins "Item Social Share"
3) 2Checkout’s online processing services are available in over 200 countries worldwide. Suppliers or banking institutions from the following countries are currently excluded from any type of operating arrangement with 2Checkout: North Korea, Cuba, Iran, Sudan, Syria, Myanmar (Burma). - Buttons for admin. Admin can mark any item as Premium, Highlight or Move to Top. Osclass Paypal plus payment plugin Plugin allow users pay Premium, Move to Top, Highlight and Pay Publication on the classified website. Osclass Paypal plus is a perfect tool to make an additional income from your website. It allows you to work with Paypal micropaymets/API or Standard Payments. Premium Listing status Premium status is a standard feature for Osclass script when the l..
Payment plugin for Indian payment system PayUmoney. Work with INR only! Payumoney offers payment methods: credit/debit card, netbanking, PayUmoney wallet, PayUmoney points. This local system, one of the most popular payment systems in India. Safe and reliable. Osclass PayUmoney plugin - for additional income from you classified site. Premium This is a standard feature for Osclass scri..
Osclass payment plugin Braintree plus allows you to work with Braintree. Offers payment methods: Debit/Credit cards. 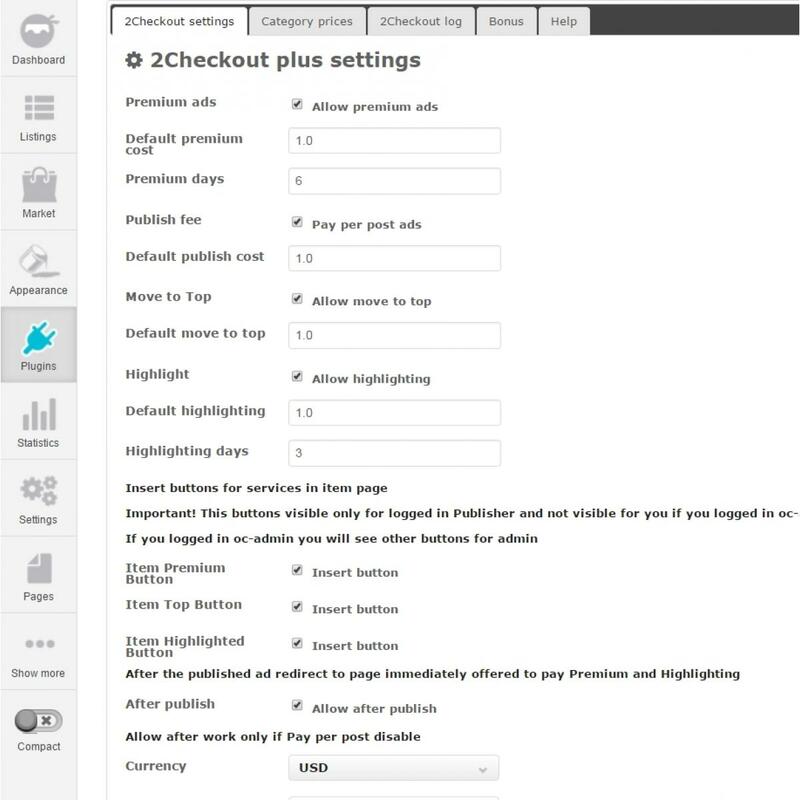 Plugin allow users pay Premium, Move to Top, Highlight and Pay Publication on the classified website. Premium Premium is feature for Osclass when the listing shown on top of free ads. The plugin allows to automate this process. Any user can pay - Premium. Administr..
Plugin allow users pay Premium, Move to Top, Highlight and Pay Publication on the classified website. Osclass Skrill plugin allows you to work with Skrill Quick Checkout. Skrill Quick Checkout includes card payments VISA, Master Card, Maestro, American Express, JCB and other. Premium Premium is feature for Osclass when the listing shown on top of free ads. The plugin allows to automate ..